Even though this book has all the makings of a paranormal romance novel – hello, living woman from the present and dead man from the 1860s fall in love – it doesn’t read like one. In fact, if it weren’t for the constant reminders Tristan’s dead, Spirit of the Rebellion could easily be hailed as a regular ol’ romance novel. I’ll keep this one short and sweet: our two main characters, Shae and Tristan, meet when Shae takes a position translating Civil War documents. 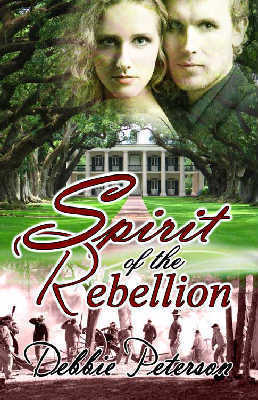 She moves back to the United States (she had been living in Norway for the few years prior) and is given temporary residence at the Starling Plantation. It’s no secret Starling is home to multiple spirits. People don’t enjoy spending time there and anyone who attempts to settle in has been driven out quite forcefully by a particular spirit. Unfortunately for him, Shae is as stubborn as they come and having papers scattered about her desk isn’t nearly enough to scare her off. As Shae comes to know the spirits (I loved how she introduces them to modern technology – they have movie nights, for example, and 12-year old Timothy is particularly intrigued by Lord of the Rings), she uncovers the truth regarding Tristan’s past and the cause of his death. History branded him a traitor and as she translates documents, she discovers what really happened. I have an extremely large interest in the Civil War and was eager to read this novel. Its faults are few and the writing is gripping. The story moves very quickly and the chapters are all fairly short (around 10-ish pages). Unfortunately for me, that wasn’t necessarily a bad thing. lol multiples times I fell for the trap of “I’ll only read one more chapter!” and, because the chapters are so short, wound up sneaking a couple more in. Before I knew it I was halfway into the book! Thank you for the review Leah! So, I’m sitting here thinking about what to say, how to comment on your review. Let me say this kindly, ARE YOU SERIOUS! This sounds COMPLETELY ridiculous! You really liked this book? A ghost romance? Really!?? Sincerely, with hugs and kisses, Mom.